Indoor 5-in-1 electronic rodent and insect repeller. Get rid of mice, rats, roaches, scorpions and more. Keep pests out of kitchens, bathrooms, bedrooms, dining rooms, living areas, garages, and other indoor areas. Limited Time Only: Get 3 for only $79.95! Transform your home or business into a pest-free zone without chemicals, poisons, or traps. 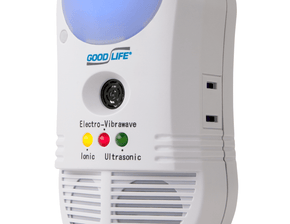 The Ultimate AT attacks insects and rodents with a unique combination of high-pitched ultrasonic sounds, electromagnetic pulses, and air-cleansing negative ions. Unlike the cheap alternatives seen on big retail sites, the Ultimate AT has been trusted by families, schools, hospitals, and businesses for over 17 years. And if you need any help along the way, we are available by telephone, live chat and email whenever you need it. Bombards pests with disorienting, high-pitched noise while you dont have to hear a thing. Irritates the nervous systems of pests that are sensitive to electromagnetic frequencies. Like a cleansing rain storm, Negative Ion Technology pulls dust mites, bacteria, and odors from the air that can attract pests. Includes a side plug-in so you don't lose any precious outlet space. The number of Pest Repeller Ultimate ATs needed for optimal coverage will vary based on your situation. However, since ultrasonic sound waves bounce off solid objects like walls, we typically recommend one unit per affected room. Place units evenly throughout your home to help prevent pests from spreading to other rooms. Keep doors open whenever possible to allow ultrasonic frequencies to travel farther. Take advantage of our limited time Buy-2-Get-1-Free special for maximum coverage! Sit back and relax while the Ultimate AT protects your home from top to bottom. Stop embarrassing roaches from invading your kitchen. Get rid of nasty ants and silverfish lurking in your bathroom. Prevent hungry rodents from destroying what's stored in your garage or attic. Invading pests are flooded with loud, disorienting noise while you don't hear a thing. This unpleasant sound ricochets off walls and other solid objects forcing pests to flee the area. Ultrasonic sound output is specifically designed to target insects, mice, rats, and other rodents. This feature sends pulsing vibrations along the wiring in your home, irritating the nervous systems of insects and rodents hiding deep within your walls. These shifting frequencies are completely safe for you, your pets, and electronics, but pests will have nowhere to hide. The Ultimate AT releases streams of beneficial negative ions into the air, similar to those in the atmosphere during a rainstorm. This alone makes pests want to seek shelter elsewhere. In addition, these ions pull pollutants, bacteria and dust mites from the atmosphere, helping neutralize odors that can attract pests. What pests are repelled by the Ultimate AT? Ants, rats, roaches, mice, silverfish, centipedes, and scorpions. What pests are NOT repelled by the Ultimate AT? Although some customers have reported success with these pests, results have varied with spiders, bees, mosquitoes, flies and other flying insects. Does the Ultimate AT *kill* any pests? The Ultimate AT does kill dust mites, but it is not designed to kill anything else. The AT repels insects and rodents, but does not kill them. This is beneficial because you don't have to deal with removing any dead pests from the inside rooms or walls of your home. The pests are humanely and safely repelled back outside. Where should I use the Ultimate AT? The Ultimate AT is designed for indoor use. The ultrasonic sound waves emitted from the Ultimate AT will utilize the inside walls of your home to bounce around and fill the room with pest-repelling sound. The height at which the AT is plugged in does not really matter, as long as the AT is plugged into an open area. For best results do not plug the Ultimate AT in behind any large furniture that will block its speakers, such as couches, bookshelves, stoves, refrigerators, etc. Many types of pests are attracted to areas with food smells and water, so a common recommendation would be to place an Ultimate AT in your kitchen and bathroom. Always place a unit in the room(s) with the worst pest problem. Is the Ultimate AT safe to use around children? The Ultimate AT is designed to be perfectly safe to use around people of all ages, including small children and newborn babies. Is the Ultimate AT safe around pets? Although the Ultimate AT is safe to use around most house pets, we recommend closely monitoring your pet's behavior for the first 48 hours while using the Ultimate AT. Cats/Dogs: while rare, it is possible that some cats and dogs may hear the sounds produced by the Ultimate AT. Each pet and situation is different, so our 45 Day Money Back Guarantee will give you time to use the AT around your pets and ensure it doesn't bother them. Birds: birds vary so much in size, breed and behavior. We have no way to guarantee the Ultimate AT will or will not bother your bird. To be safe, we recommend not using the AT in the same room as your bird, or near the birds cage. Some customers have reported their birds seem bothered by the ultrasound; other customers tell us their birds seem just fine. Fish: fish will not be affected by the Ultimate AT Reptiles: reptiles have much lower hearing ranges than mammals (i.e. people, dogs, cats, and rodents), so they will not be affected by the Ultimate AT. This also means that the Ultimate AT cannot be used to repel reptile pests. Rodent pets: rodent pets include rabbits, guinea pigs, chinchillas, ferrets, hamsters, mice, gerbils, rats, degus, prairie dogs, and sugar gliders. Since the Ultimate AT uses ultrasonic sound designed to repel rodents, your rodent pets will be bothered by this unit. But, since ultrasound does not go through walls, rodent pets can be kept safely in a bedroom (or another room) behind a closed door. Your pet will also be safe if the Ultimate AT is used on the other side of the home, or on a different floor of your home, or if the pet is outdoors and the AT repeller used is indoors. Can it be used around medical devices? As we are not medical doctors, we cannot guarantee that the Ultimate AT will be completely safe around medical devices. Although no one has reported problems to date, we strongly recommend consulting your physician before using any type of electronic around a medical device such as a hearing aid, pacemaker, defibrillator, etc. How does the AT compare to other electronic repellers? Unlike traditional pest control, the Ultimate AT is safe to use around your family and pets. The Ultimate AT does not use any chemicals, traps, or sprays, and it is silent to the human ear. Although you may see other electronic pest repellers at large chain stores or home improvement stores, they are no match to the Ultimate AT! Many of the store-bought units are made with paper speakers, so they may only last you a few months before they quit working. The Ultimate AT emits sound from a ceramic high-pressure transducer — a very powerful, high quality ceramic speaker. Some types of electronic pest repellers claim to work inside your walls, but this feature alone wont repel anything already living in the rooms of your home. For example, a repeller that only works inside your walls will not target the roaches already living on your counter tops or floors! The Ultimate AT utilizes Electro-Vibrawave technology throughout the wiring in your walls, and fills the inside rooms of your home with a piercing high-pitched ultrasound that only the pests can hear. These technologies combined with powerful negative ions make the Ultimate AT the best indoor electronic pest repeller you can buy! Should I buy the Ultimate AT or The Guardian? The Ultimate AT is our best indoor pest repeller because it covers the area where it's plugged in, as well as the insides of your walls. The Guardian also repels rodents and it can be used indoors or outdoors. Although it emits a very powerful ultrasound, this unit will not reach into the walls of your home like the Ultimate AT. The Guardian; is our best product for yards, patios, basements, attics, and other areas that may not have weather protection or electrical outlets. The Guardian can run on battery or electrical power. For details regarding large quantity/bulk orders, please contact our Customer Care Department at 800-657-8214 or 541-245-4488. How do I get the correct plug/voltage for my country? Does the Ultimate AT require any adjustments or maintenance? The Ultimate AT is 100% maintenance free. As soon as you plug the device into your wall, it goes to work for you! There are three blinking lights on the front of the unit that show you each of the Technologies are running. The Ultimate AT emits powerful negative Ions to kill bacteria, dust mites and food smells that may attract pests, but there are no filters that need to be cleaned or changed. You just plug it in and go about your daily life! How much area will the Ultimate AT cover? In a large open area (without inside dividing walls), the Ultimate AT will cover up to 5,000 ft (1500 m). For example, one unit should cover a large open attic, open basement, or open kitchen/living room area. Please note: the Ultimate AT's Electro-Vibrawave® will only cover the electrical circuit that the unit is plugged into. Most modern houses have multiple circuits isolated from one another for safety reasons. If you wish to cover all circuits please purchase multiple units and spread them throughout the house. Why do you recommend multiple units? Although the Ultimate AT uses Electro-Vibrawave® Technology inside the walls of your home, the high-pitched Ultrasonic sound that fills the inside of the room will not go through walls. This is why we recommend at least two to three units per floor of your home for best results. Units can be placed in different areas of your home, depending on your home's floor plan and where the pests are a problem. By using multiple, strategically-placed units throughout your home or office, you effectively distribute the Ultrasonic pest repelling sound throughout the structure. This optimizes your overall Electronic Pest Control. Although the Electromagnetic feature will travel throughout your home wiring with the use of one unit, it has been our experience that using more than one unit simultaneously presents the greatest results. One unit is better than no units, but multiple units will yield more powerful results than one unit alone. Although many customers report results within a few days, we recommend you give the Ultimate AT 2–4 weeks to completely eradicate your pests. Results can vary depending on the type of pests, location, and degree of infestation. Note: be aware that under some situations of extreme drought or other adverse conditions, the pressure on any creature becomes so great that survival overrules any deterrent. Will I hear or smell the Ultimate AT? The sounds emitted from the Ultimate AT are above the normal human hearing range, although some people can hear a very faint beeping sound (virtually undetectable). The AT sends out negative ions to trick pests sense of smell to think a storm is approaching (similar to the smell before a rain storm). However, these smells are undetectable to humans. The Ultimate AT will have no noticeable odors. The Pest Repeller Ultimate® AT uses approximately 8 watts of electricity per hour. Our pest repellers are designed to be economic and energy-friendly. What is the On/Off/Sensor switch for? The Ultimate AT is working and repelling as soon as its plugged into the wall. The on/off/sensor switch on the side of the unit is simply to control the night light feature. Sensor mode will cause the light to come on in the dark, and turn off in the light. The night light switch will in no way affect the performance of the Pest Repeller. What are the three blinking lights? The red light shows you when the Electro-Vibrawave® Technology sends vibrations through your wiring. The green light blinks when the Ultrasonic sound is emitted. The red and green lights will blink intermittently. The Ultrasonic and Electro-Vibrawave technologies are used at random pulses to constantly startle the pests and prevent them from getting used to these sounds. The yellow light represents the Ionic feature. The yellow light will be on all the time because the AT is constantly emitting negative ions. What if I don\'t see any lights blinking? First try plugging your Ultimate AT into a different outlet. If that doesn't help the unit might be faulty. Good Life works hard to maintain the highest level of product quality and we will be happy to replace this for you under warranty. Please contact our Customer Care Center to obtain an RMA number for an exchange. How long do these units last? The average shelf life of the Ultimate AT is about 2–5 years, although some customers report them lasting even longer! All of our products come with a one-year manufacturer's warranty against defect, and optional protection plans can be purchased for just a few dollars. Where can I find information about the warranty and/or guarantee? You may read the details of our 90-day money-back guarantee and warranty information by clicking here. Your 90-day money-back guarantee begins the day your product is delivered to you. We recommend you keep the Ultimate AT for at least two weeks. If for any reason this does not work for your situation, please contact our office at 800-657-8214 to obtain a return merchandise authorization (RMA) number. Can it be used near home electronics? The Ultimate AT is designed to be safe for use around common household electronics such as stereos, TVs, computers, and kitchen appliances. We do recommend you consult an electrician before using the Ultimate AT around finely-tuned or valuable electronics, or custom electronic systems such as X-10 home automation or power line networking. Save big when you bundle. For a limited time, save $70 when you buy the Ultimate AT 3-Pack! Complete pest protection inside and outside. This bundle includes (2) Pest Repeller Ultimate ATs for indoor use, and (1) Guardian for outdoor coverage. This All-Purpose Insecticide is a non-hazardous and non-flammable spray that kills insects on contact. Works great for ants, bed bugs, beetles, cockroaches, fleas, flies, mites, mosquitoes, spiders, ticks and more.